He was ordained in 1847 for the Archdiocese of Dublin but in the same year affialiated to Cork, his home diocese. Appointed Canon of the Cathedral Chapter in 1867. Appointed Vicar Forane (V.F.) of the Kinsale deanery in 1874. Appointed Papal Prelate with title of Monsignor in 1888. In 1873 he purchased a plot of land in Croghtamore and assigned it in 1879 to Mgr. Henry Neville upon trust for church purposes. Today, the Church of the Immaculate Conception (The Lough) occupies the site. His Lordship, Most Rev. Dr. O’Callaghan, Bishop of Cork, presided at the Solemn Requiem Mass. The celebrant of the Mass was, Very Rev. Augustine Canon Maguire, P.P., St. Finbarr’s South; deacon was, Fr. 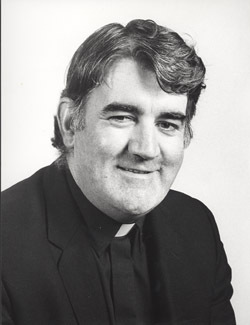 Michael O’Sullivan, C.C., Ss. Peter & Paul’s; sub-deacon was, Fr. William X. McCarthy, Chaplain, St. Raphael’s Asylum for the Blind, and the master of ceremonies were Fr’s. Joseph O’Keeffe, C.C., and John Cassidy, C.C., St. Patrick’s.